A contemporary Sephardic song celebrating the eight nights of Hanukkah. A Children's folk song from Israel. A lyrical melody composed during the Italian Renaissance. This festive song was adapted from the original Yiddish folk song, "Y'mey Hanukkah:"
Dreydels we can play with and latkes to eat. The traditional prayer sung as the Hanukkah candles are lit each night. One of the most beloved melodies of the Ashkenazic tradition, this popular song often closes the candle lighting ceremony. An enchanting Hanukkah melody by 19th Century classical composer Felix Mendelssohn. A children's folk song about the lighting of the candles. 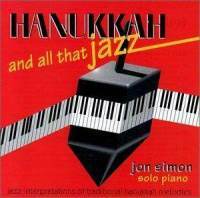 A swing medley of two of the most popular Hanukkah songs. Recorded and mastered by Steve Forney at Dajhelon Productions, Inc. Rochester, NY.